So, you think that building a democracy – or being the ultimate jerk / dictator the world has ever seen is a breeze? Hahaha (that’s my evil laughter here). You know nothing! Not when your own brother is trying to sabotage you and install his behind on your chair and send you to meet your maker. And you can’t even assassinate the poor soul, because the people love him and you need the people to rule. Not to mention money, resources, great relations with your neighbors, the US, the EU, the fundamentalists, the liberals, the capitalists and those pesky journalists who have the guts to remember that you promised modernization of the education system – and remember that exactly when you have no money left to do it. 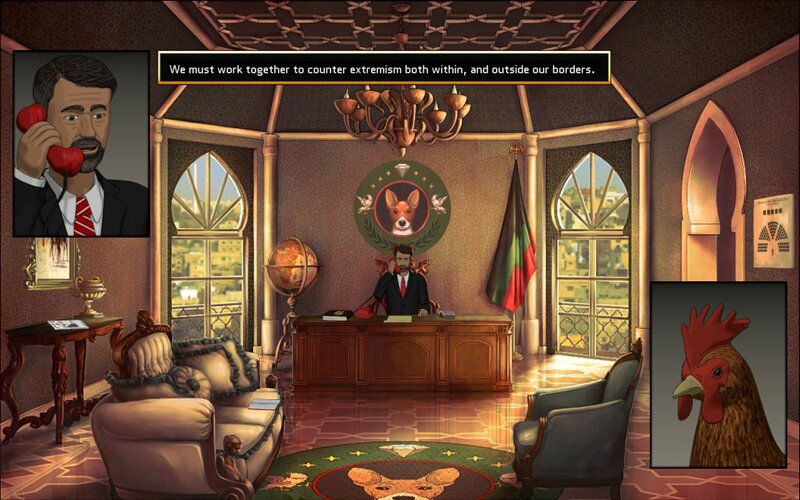 This is Rogue State. This is fun! If my first paragraph made absolutely no sense, let me try to clear things out: you start the game as the revolutionary leader and new president of a fictional middle eastern country and it’s up for you to rebuild the great nation of Basenji, gain the love and trust of the people, build up the relationships with your neighbors through democracy and keep your brother, Farouk, from throwing you off your chair and install himself as president. Rebuild infrastructure, intelligence agencies, adopt and change policies and do everything you can to keep on playing. Because in the “democracy” you’re building, you will eventually fail. Eventually! 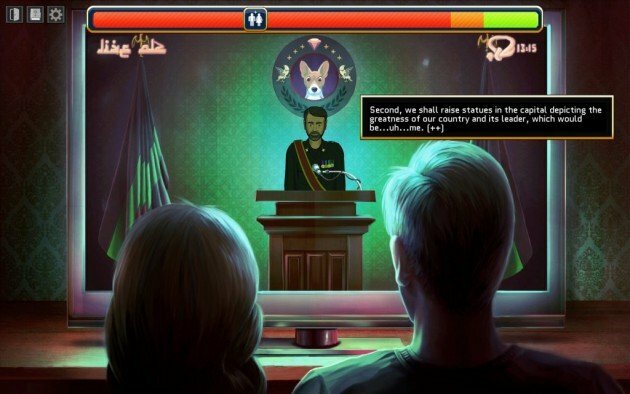 This political simulation game with a big dose of humor (one of the neighbor states, for example, is ruled by a chicken!) proves to be extremely complex and offers so much depth that every new playthrough will feel like a brand new experience – and you’ll love to see that you’re getting better and better. 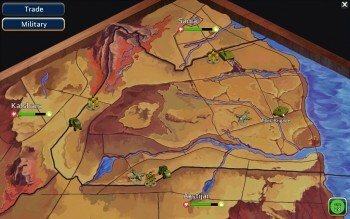 A turn based game with each turn offering you the chance to perform four actions, Rogue State surprises and amazes even though at first it might seem a bit too difficult and random. Your main role in the game is to find the perfect balance in the policies you adopt (and there’s quite a few of them) to try to keep your people happy. You have liberals and fundamentalists, capitalists and patriots as the four distinct categories in the countries: and you must keep them all happy otherwise they’ll start rioting and eventually overthrow you. This is done by adopting the right policies, but also by building special infrastructures for your great nation. Also, special events are triggered every time you end your turn and the way you decide to handle them will have different effects on your people, neighbors and nation’s partners. The fun part? You can’t really know what the effects will be until you’ve made your choice. And that’s fun! 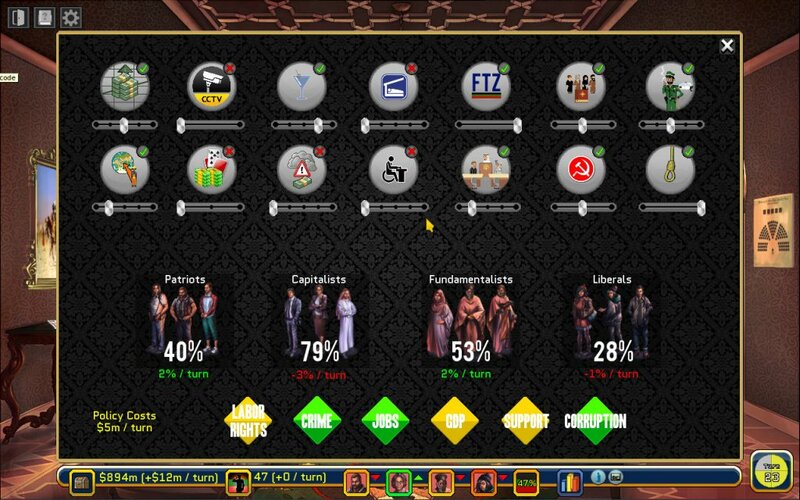 On numerous occasions, I found myself comparing the game with Democracy 3 and it does have common points. 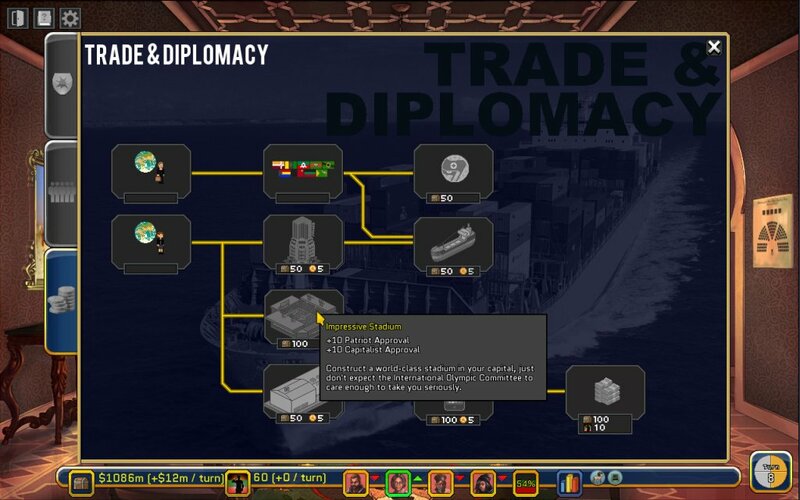 However, I found Democracy way too random and boring, while Rogue State delivers better quality, seems to make more sense and adds a few visual elements that make everything a bit more enjoyable (even though the graphics are far from perfect). But there’s something about this game that really makes you care about it, challenges you, pushes you to try again to do better: things that make sense and events that can sometimes help, not just try to destroy you over and over again. It’s a lot of randomness here as well, but there are also so many beautiful cause-effect connections that increase the complexity, your strategic approach and offer so many gameplay options that you will never feel bored. For example, raising the taxes quickly will have a major effect on the mood of all your groups, but the drop in morale will get lower and lower each turn – which makes sense, as more people will accept the new situation. The same goes with dropping the tax rates: people will get really happy for a short while, but then there will be no extra bonus from that, because it will feel normal. Will you raise the wages? The Capitalists won’t like that, but other people will. Will you ban religion in schools? Fundamentalists will hate you, but liberals will love you. Every thing you do in the game will have an effect (and the beautiful thing is that some only have an effect several turns after your actions) and your main goal is to find the perfect balance. You can’t keep everybody happy, you must align yourself with one or two particular groups, but you can’t ignore any of them if you want to be the ruler. And as a ruler, you have a lot more options on hand: you can and should rebuild the nation by spending money on infrastructure. 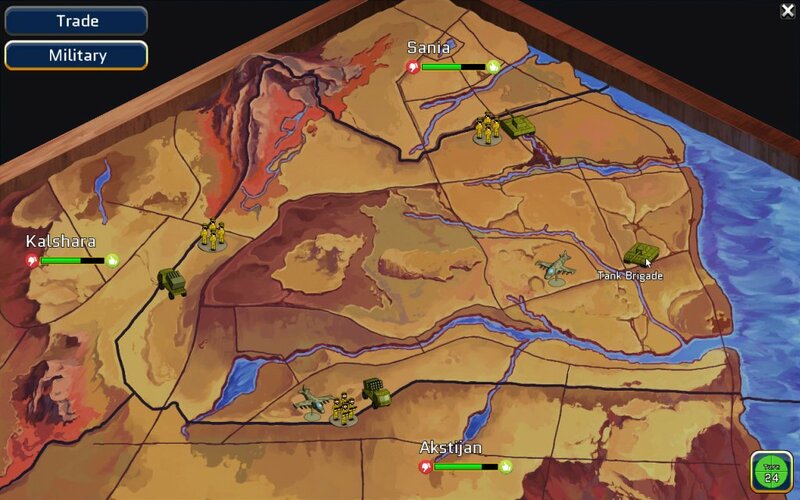 Each building comes with extra boosts and bonuses, and a good strategy here is required too. Your ministers will have requirements from you every now and then, and you should make them happen if you want to keep your relations in good standing. 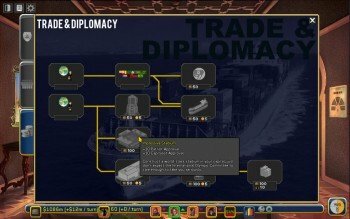 Your neighbors are always around and you can trade with them or even build a military and attack them. Hell, you can even go completely mad and start a nuclear war if that’s what you want to do! Then, there’s the humor: sometimes crude, sometimes nuanced and barely visible. We have a country that’s being ruled by a chicken who can’t be understood, there’s the US to whom you don’t have direct access, but can be impressed if you have oil (and they bring you no “freedom” for it) and you have the newspaper that never runs out of puns and jokes. It’s brilliant! Rogue State does have its limitations: it’s an indie game with a lower budget and there are some things that get boring after a while, the most frustrating being the constant need to adjust policies based on the groups of people in your nation. The graphics won’t blow your mind either, but this game still manages to deliver so much fun in its small package that it’s almost unbelievable. And I certainly found it more fun than Democracy which has more polish, but not as much appeal and power of attraction. So if you’re up for these kinds of games, head over to Steam and get yourself a copy of Rogue Nation. You’ll find out just how fun it is to constantly fail as a leader!